Here is an almost daily scene in our house. “Now you KNOW that isn’t true! Things sometimes escalate. There are tears. Consequences. Conversations. And, in the end, I am in a room with each of my children, one at a time, listening to their heart broken, angry, scared story of what they think happened. Do they ever get caught in a lie? Sure. Did they usually do SOMETHING wrong? Yep. But, in the end it becomes strikingly clear that everyone’s version of the story…is somewhat…true. Their version of the story. What they read into the experience, the dialogue, the events. I see it through their eyes and as an outside observer I get a pretty clear picture that none of my children are villains. They have faults. They don’t always have the best judgment. Their vision is sometimes skewed. They need appropriate consequences. But, hateful, vile villains? Absolutely not. My oldest daughter recently decided to follow one of those schedules to read the bible through within a year. She found it in her new bible she got for her birthday. She checks off what she reads each night. Her daddy has encouraged her to skip around when she gets bored with one part. There’s nothing wrong with that, he told her. Almost every day I will ask her what she is reading and her thoughts on it. She read through to Exodus, got bored, and, like her daddy suggested, moved to the New Testament for a while. One morning at breakfast her reading becomes part of the discussion and she starts to tell us about how Matthew describes the birth of Christ. “It seems like he kind of rushes through the story. Did you know that each of the gospels tells about the birth of Jesus a little differently?” We talk about how different each person…Mathew, Mark, Luke, and John…were…and how each person probably noticed different things and how each person may have thought different parts were important to tell. We talk about how Luke, the physician, was probably more aware of the miraculous healings because they probably rocked his world as a person of science and how her Uncle Tim, a physician, also likes to read books that look at faith and science. We talk about how incredibly cool this is and how it gives a full picture of what happened. We talk about how wonderful it is that God allowed for not one, not two, not three…but FOUR different voices to tell about the life of Christ. It is almost like God knew that just one human take on the birth and life of His Son would not do it justice. We needed four different versions. I stop talking, listen, and my mind drifts off. A week or so ago someone, a remote friend, posted an article on Facebook and I had my own little rant with God. Short lived, but rant none-the-less. I imagine me, like one of my children, sitting in a room with God… listening to my heart broken, angry, scared story of what I think happened. All while I want them to listen to me, I struggle to slow down and allow them to tell their version of the story….which I so desperately want them to allow ME to do. Sometimes I think a person’s version of the story is based on irrational and false premises, that it has disasterous, abusive, generational consequences. I want them to…HURRY UP! And, get to where I am so I they can be enlightened and GET. IT. And, in that moment of conversation with my oldest daughter I remembered that God made room for different versions. He has made room for them for a long, long, long time. Someone might like to argue that the gospels never contradict one another. Some could argue that they do. But, as a parent listening to the different voices of my children, I understand that contradiction doesn’t necessarily make one story more true than the other. It is about perspective…beautiful, rich, contextual perspective. It just tells us something about the teller…the contradictions, among the gospels and among our own lives, tell us as much about these humans that are desperate for a Savior as much as it tells us about the Savior Himself. Making room for other voices, for other versions, does not mean not pushing those other voices to think, does not mean avoiding asking good questions…but, I have to be open to the questions, too. It does not mean I quiet my own voice, my own version. It does mean I make room for them. It does mean I seek to understand. Are we all telling some lies, some falsehoods about the story along the way? Probably. Do we usually get SOMETHING wrong? Yep. But, in the end it becomes strikingly clear that everyone’s version of the story…is somewhat…true. I wonder if God sees it as an outside observer and gets a pretty clear picture that none of His children are villains. They have faults. They don’t always have the best judgment. Their vision is sometimes skewed. They need appropriate consequences. Sinners? Yes. But, hateful, vile villains? Absolutely not. This Christmas season I invite you to make room for the orchestra, the choir of voices that make up our faith communities. Let’s listen. Let’s appreciate the telling. 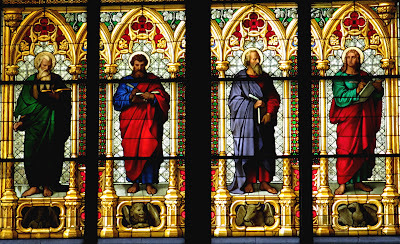 ***Picture is the four authors of the gospels from the Cologne Cathedral in Germany.